I was delighted at the start of the year when I chatted to the grade level leader of Grade 4 that she was full of excitement for doing more technology integration into all Grade 4 classes. One of the major projects she wanted to hop on board with was stop motion animation. The twitch in my left temple twitched a little bit more when she mentioned that she wanted to do it with her first unit of the year about Rocks & Minerals! So some research, some rubric making, some discussions, some more discussions and we were ready to plan it all out. It was quite a bold plan and involved a lot of different classes. But it was so exciting! Stages and rocks would be made in Art Class. Scripts would be made in English class for each stage of the rock cycle. 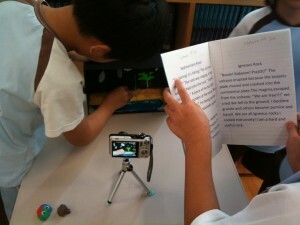 Finally in our science classes we would do the actual animation and voice recording. The rubric was challenging, I found some examples on the Internet and tried to keep it simple for the students to understand. We are moving to a 7 point grading scheme this year so that was another challenge to overcome. We can certainly all agree that this rubric is in its infancy. It comes down to a battle of changing adjectives to suit the grade; which is horribly banal. As we were working in groups of four we had to work on roles within the group. A director, a photographer and two stage hands. Team-work can be challenging at this grade and divvying out the different roles is important to try and guide the students along the way to effective teamwork. Was the role segregation 100% effective? No, not all the time but it was always mentioned (“Wait, Sam is the photographer…”) when roles were becoming blurred. After just one class (albeit a triple period!) we managed to get each group to finish their animation. It wasn’t looking good for a while but we did get there. It is quite the challenge! We started the lesson revisiting what we remembered from the animation we did online last year (Doink!) and the differences/similarities between that and stop motion animation. We then had a look at the rubric with which they will be graded on and use to self assess themselves. The classroom teacher took a group of 4 and I took a group of 4. While the other two groups worked on other things. As everyone had created a stage and everyone had written a story for each stage of the cycle there had to be decisions made on which stage to use and whose corresponding story to narrate with. This wasn’t as hard or as laborious as I thought it would be and both groups I worked with decided pretty quickly. The actual animation goes pretty smoothly to be honest. Initial placing of camera and tripod and placing the stage and reinforcement of keeping the stage and camera constant takes a moment. Photographer snaps, gives the word and stage hands move object and keeps stage still. Director gives pointers and get stuck in from time to time! A problem we had with the first team was sticking the hard rock to the very flimsy volcano; lots of blue-tack was the answer but lessons learned for next time and the creation of the stages. We had instructed to each group that their animation had to be at least 20 frames due to the length of their narrative so they worked towards that. One part I particularly liked was that both teams turned on the preview mode on the camera to see how the movement was coming along with no instruction from me. So memory card from camera into computer and straight onto the desktop to keep everything running smoothly. Windows Live Movie Maker is very straightforward for the students and before long they had their timeline in place and were tweaking the time per frame. In both groups I had to insist that they make the seconds per frame a bit longer due to the length of the story they had to voice over with. Of course the less amount of time per frame the better it looks and they realised that. Recording in Audacity a breeze and export as .wav. This is when we ran into technical difficulties! There is something wrong with the audio capabilities of our classroom desktops. The recordings came out so very low and I had already checked these headphones in our computer lab. So the following week (today!) we had to traipse up to the computer lab to record the voice-overs in Audacity. Not the end of the world but definitely not acceptable. There will be meetings! Metamorphic Rock Stop Motion from Colin Gallagher on Vimeo. Igneous Rock Stop Motion from Colin Gallagher on Vimeo. Sedimentary Rock Stop Motion from Colin Gallagher on Vimeo. Sedimentary Rock 2 Stop Motion from Colin Gallagher on Vimeo. Sedimentary Rock 1 Stop Motion from Colin Gallagher on Vimeo. So all in all a very rewarding activity but quite a challenging one. The students were very excited and extremely proud of their efforts and one parent has already mentioned to me how thrilled her daughter was at home after school that day. It was a new activity for all of us to try in the classroom and I must say it wasn’t a bad outcome at the end of the day. In looking at it with a critical eye it probably isn’t the most “animate-able” subject to choose. It won’t look as good as characters or animals moving around. We definitely will have a time limit for each narrative next year. This will invoke more planning and teamwork between team members and more awareness of how many frames each animation will need to look smoother. We realize each animation does not look smooth but at the end of the day we were looking for a value added experience to the learning. It will be documented, included in the unit plan and improved upon next year.